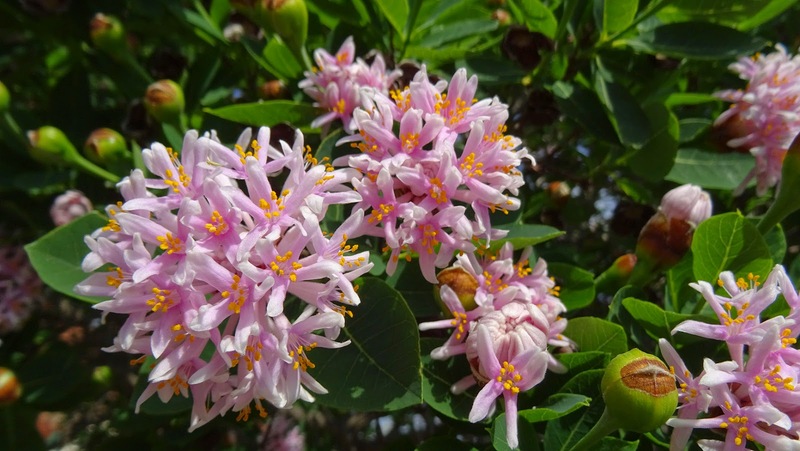 Dais cotinifolia, known as the Pompom Tree, is a small Southern African tree belonging to the Thymelaeaceae family. It occurs along the east coast northwards from the Eastern Cape, inland along the Drakensberg escarpment through KwaZulu-Natal and the Transvaal, with an isolated population in the Eastern Highlands of Zimbabwe. It flowers profusely during the summer months and produces a multitude of pink, sweet-scented, globular flowerheads about 10 cm across. Depending on the circumstances it can reach a height of up to 12m, although it rarely exceeds 6m in cultivation. This is a beautiful ornamental tree and the delicious scent of the flowers can make the whole area around the tree replete with fragrance. Beautiful flowers! Think I've seen these here too, but I wouldn't know if they called it the same. Thanks for hosting! I wouldn't mind some of that fragrance right about now ... Thanks for hosting! Lovely blossoms! Enjoy your weekend!